I am obsessed with Fury Road. My brain keeps returning to small moments of it, revisiting images I liked, chuckling over clever lines. (I can’t stop saying “Oh, what a day! What a lovely day!”) And to feed my obsession, I can not stop reading articles and blog posts and reviews about the movie. One that stood out for me was Chuck Wendig’s post “HOW MAD MAX: FURY ROAD TURNS YOUR WRITING ADVICE INTO ROADKILL.” Go ahead and check it out. I’ll just wait here, re-reading Amazon customer reviews of that silver spray frosting. Oh man, those are good. Story-telling is not the point of movie-making. Movies are not about stories. The point of a film is create images that come to life in the viewer’s mind. Story is just a tool to create that life, because the human brain is a story-telling machine. Our brains have evolved to spin an ongoing narrative that creates our own personal identity, and because of that, story is our primary tool for comprehending the world around us. All forms of communication can tap into story as a way to make their points more understandable, meaningful, and affecting. But it’s important to remember that we understand film differently than we understand the written word. A film can explore different kinds of problems than a novel can. A film can address many different issues and handle them effectively through the careful crafting of images. 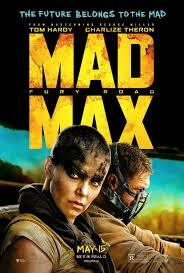 It is entirely possible Mad Max: Fury Road is primarily about the question “What is the relationship between orange and blue?” When you watch that movie, you will see an amazing amount of orange and blue, and the tension between those colors, highlighted by the blacks and whites of the actors and machinery in motion, is one part of its atmosphere of excitement. One of the things Chuck points out in his blog post is that Fury Road‘s worldbuilding is barely developed. That’s true, in a way. George Miller chooses not to linger on worldbuilding details or to explore them thoroughly via dialogue or plot elements. What Miller does brilliantly in this film is to create a scaffolding of what Guillermo del Toro calls “eye protein.” These are visual details, small but observable, that provide a framework of meaning in every shot of the film. You, the audience, are expected to build the world from these bits of information. The world becomes more rich because of your inferences and interpretations than it would from having a world laid out for you. As you wonder about how “gasoline” became “guzzoleen,” how scarification became an important part of the Citadel’s culture, how deformity played into class structure, your develop your own themes, your own dictionary of symbols, your own powerful engagements with George Miller’s ideas (and even ideas he never entertained, but which you draw yourself from the visual elements). Your engagement with the images is what the movie is about. Those blue curtains might have been meaningless to the creator. They might mean nothing to you, beyond a reminder of your grandmother’s kitchen, all tastefully color-coordinated in blues and whites, leaving you with a vague sense of stuffiness, and a feeling that this book is somehow old-fashioned. 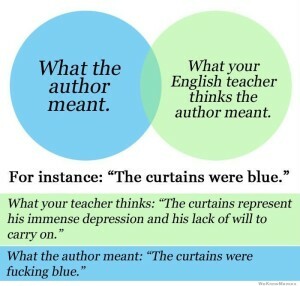 But just because you don’t see the same meaning as your teacher or the author, doesn’t mean your teacher is wrong. Interpretation is the point of communication. Maybe you buy what I say about movies. You’ve watched a lot of David Lynch flicks, maybe absorbed some weird documentaries that throw images at your eyes without bothering to include characters or a plot. You can see that yeah, movies do a lot more than just tell stories, and we can enjoy movies for reasons beyond their story-telling. But didn’t I say this all had something to do with writing? Story-telling is not the point of written fiction. The point of a novel or a short story is to create affecting moments of prose that come to life inside the reader. Story is just one tool we have available to us in the creation process. It is, like character and setting, a surface effect of the prose, the language itself, which moves on a current of ideas, images, and sounds. 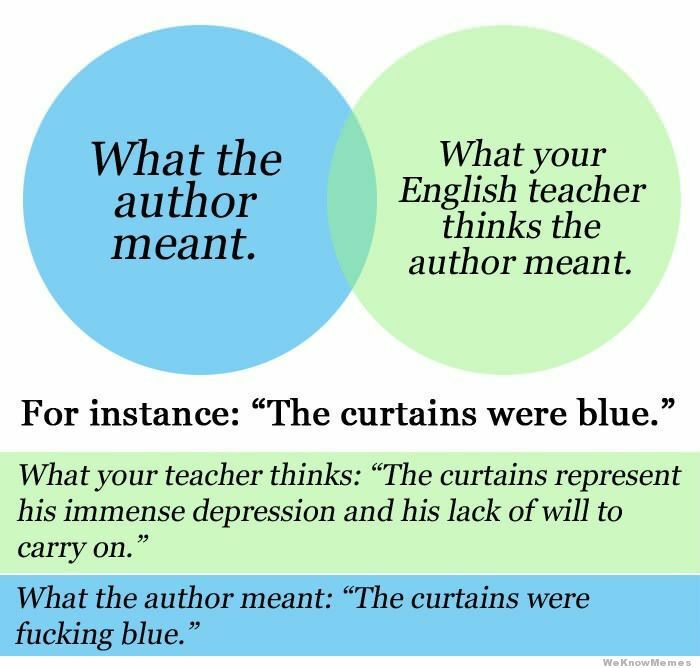 And it the job of the writer to add details that are worthwhile, details that are more important than blue curtains (unless those blue curtains are important to you, the creator), details that build a scaffolding of meaning for your work. Because art is about meaning and about sharing what is important to you. It is about cutting off a piece of your brain and sending it out to the universe. None of this is to say that story is not important or not enjoyable. I am just saying that no matter how many screenwriting books you read and how carefully you follow the rules of storytelling, there is more to writing than all those rules. There are blue curtains and chrome paint and boys with their faces stapled together. There is a road, and it is furious. Very thought-provoking, which seems to be the whole point of everything 😉 and explains the existence and popularity of fan-fiction. I find myself drifting off daydreaming while watching movies or tv shows. I’ll get hung up on a line or plot point and start envisioning a whole new storyline. Which explains why I need to watch movies multiple times before I really see it all. There has some people who cannot see perfectly or starting to see things unclear they definitely get to here to get protein..